“The Indian Hill Lab at Naperville is built on the site of an ancient Potawatomi signaling hill. On the prominence where Native Americans once sent up smoke signals […] Indian Hill has one of the largest computer complexes in the Middle West”. “It’s truly a great company with great people. Any community where a Bell Lab is located will have nothing but advantages. The company officials are among the most cooperative of any people you could associate with. They’ve also involved themselves with Naperville civic events. There are Lab people on the City Plan Commission and on the Economic Development Commission”. “Science Fiction Becomes Fact: Bell Labs” by Dennis B. Fradin. Illinois Issues 11, 1977. Bell Labs’ Naperville facility opened back in 1966. Last week we celebrated its 50th anniversary and the campus dressed up for the occasion. Our team was engaged in a daylong workshop that day and I missed the party for obvious reasons. But, I’m happy to share that I was able to help a bit with the photography for the posters featuring our Cloud Innovation Center, which were created in advance to the event. The front atrium (above) displays congratulatory letters from government officials and we now have a small but rather emblematic museum on site. That helps us “make sense of history” while feeling both proud of and humbled by what has been achieved in half-century. By the same token, we can also sense “history in the making” thanks to a new wave of game changing innovations in the works. My recollection is that Naperville accounts for 3,000+ patents and that there are 25+ Bell Labs Fellows among us. This is also the location that spearheaded the company’s Technology Leadership Council, which I am glad to be a member of. Thinking out loud… after a busy summer, here is another hectic month. While my blogging slowed down considerably, innovarista.org is registering as many views as this time last year, which is very encouraging. Thanks!!! Celebrating Naperville’s 50th Anniversary Retrospective makes me ponder about the need for stepping back every once in while, taking a deep breath and decompressing, which is what I intend to do by blogging tonight. 2016 got jumpstarted with an earlier celebration. We (former AT&T > Lucent Technologies > Alcatel-Lucent) joined Nokia in January. I blogged about my first impressions and had an interview featured on the corporate site’s section devoted to “My Life at Nokia”. Shortly after, Eric Bauer released his latest book: “Lean Computing For The Cloud”. I would like to take this chance to thank him for including my name in the acknowledgements section. Eric pays attention to detail, his research is rigorous and thorough. He speaks with conviction about that it takes to run lean cloud computing systems. 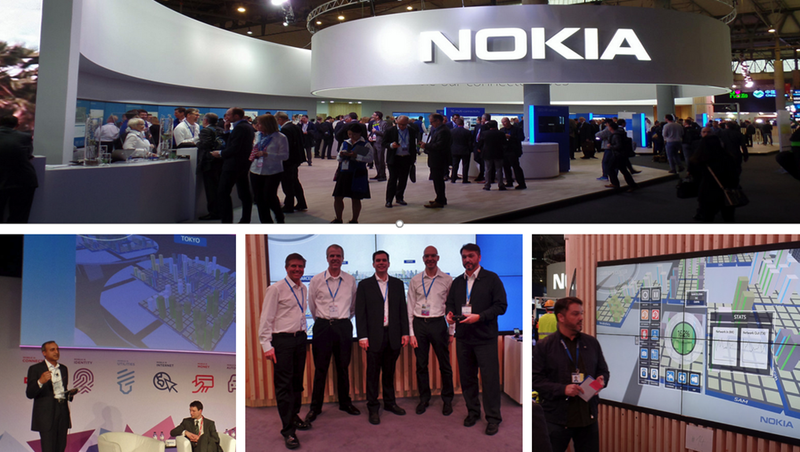 February delivered a very rewarding Mobile World Congress for our team. All the hard work (and calculated risks) gearing up to MWC paid off. The Lean Ops Project was very well received in Barcelona, featured on MWC’s stage by Bhaskar Gorti, President of Nokia Applications & Analytics, and in high demand at Nokia’s impressive booth where we run 160+ Lean Ops sessions for top executives in the high tech sector. Interestingly enough, our video has also grabbed a lot of industry attention thereafter. I had designed five different experimental 3D GUIs and researched a portfolio of use cases focusing on FMO, Future Mode of Operations. My selection criteria came down to prioritizing “ease of data visualization” and “elegant sophistication” to purposely deliver an “effortless operations experience” which become the project’s defining signature. The underlying conceptual framework involved re-defining what Lean actually entails when intertwining analytics, automation, programmability and human factors. I cannot praise enough the engagement level, dedication and professionalism of the development team at our Cloud Innovation Center. Everyone worked tirelessly on the MWC prototype, and did that under mounting time constrains, a fluid workstream, and in the midst of other challenges. I joined the new Solutions & Partners Business Unit upon my return to Naperville in March. I became a member of Ted East’s I+D team as a Design Director – Human Factors Engineering. My new responsibilities enabled me to continue to work on Lean Ops. Ted runs a highly entrepreneurial environment where the opportunity presents itself to breathe Design Thinking, Agile and Lean. Design Thinking equips us with project depth, Agile makes us dynamic and Lean keeps us nimble throughout. All key to fueling a serial innovation engine. I will be discussing this and AIM, Augmented Innovation Model, in my talk at Informa’s Back End of Innovation in November. Below you can see the ideation and user experience rooms, part of our Naperville team, and the glass showcase displaying Network Functions Virtualization Infrastructure (NFVI). Connectedness and collaboration get us to take down silos by working with other onsite teams and a number of other from other company locations worldwise. Basically, everyone is empowered to make a difference, while understanding that it takes teamwork to make things happen at speed. I should also add to that list several trips to our offices in San Jose, Murray Hill (NJ), and Villarceaux (France). Being on the road makes time management and prioritization down to “yes/no” decisions of the essence. Ron Haberman, VP and General Manager of the CloudBand Business Unit, discussing a Lean Ops video in his keynote at NFV World Congress. My presentation at IEEE Communications Quality & Reliability, which was scheduled as the sidekick to the keynote address given by Steven Wright, AT&T Executive and ETSI NFV Chairman. I had the chance to re-connect with Bell Labs’ Markus Hofmann in Toronto at Bell’s conference where he spoke on analytics and I ran the Lean Ops demonstration. Last but not least, I was deeply honored to join the Board at MIT IDSS, Institute for Data Systems and Society, in Boston. Eight intensive months have already gone by since joining Nokia. This account helps me reflect on a number of good things… all memorable stuff that I would, otherwise, easily overlook given the fast pace and relentless focus on what needs to get done next. What follows is some of the pictures that I took in my last trip to Murray Hill. “Bell Labs, which was begun in 1925, has accounted for many of the major innovations and improvements in the telephone system. Other well known inventions which have come out of Bell Labs’ research are the talking film, the laser, the radio telescope, the solar cell, and communications satellites […] one interesting project of use to researchers is the audio response system, a talking computer”. “Having achieved universal phone service, researchers are developing more useful phone services such as three-way calling and abbreviated dialing”. Bell Labs Museum. Murray Hill Campus, New Jersey.